There are two codes which come to use in the whole process of DQFanSurvey. First one is the Survey Code and the second one is the Redemption Code. 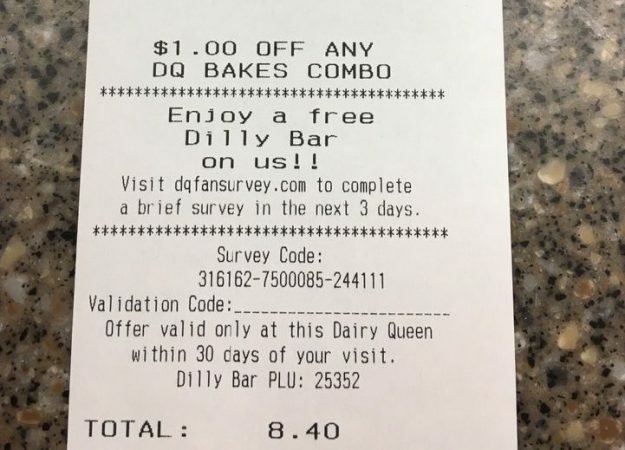 Survey Code is the code that you use to get started on the Survey, while Redemption code is the one that you use for claiming your free Dilly Bar. Don’t get confused among the two. When you make the first purchase, you get the Survey Code printed on the receipt. Take the Survey using this code, and on completion of the Survey, you get the Redemption Code. Visit the DQ store later, and present them the old receipt with the redemption code to get your free Dilly Bar! That’s how the Codes work! Make sure that the codes are secure with you, otherwise, you may lose your chance of winning the free gift.